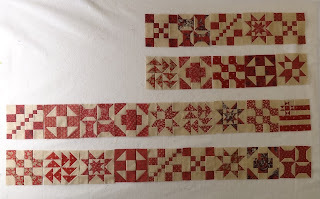 I have been "In the Zone" since my last post - working furiously to finish the blocks for my Old Glory quilt. Also, the dry and very cold weather we've had has seriously cracked the tips of my fingers, so being on the computer is agony in terms of typing. So....I've stayed off the computer and sewn to my hearts content (and Mr. Squash's amazement)! Yesterday I finished all the red blocks. The photo above is the untouched version of the photo below. Right now the only place my design wall fits is in the laundry room downstairs, so the light is less than optimal. I don't know about you, but I love taking a photo of the initial layout of a quilt. You can see more clearly what needs to be changed around to achieve balance. Because of the poor quality of this photo, it looks as though some of the blocks have a different background, but I assure you they are all made with the same background fabric. This is the layout the pattern suggests. I'll keep it, but will definitely exchange some of the blocks to make it look a tad better. This Mini Flag block is the only single block pattern - the rest are made in three's - each with a different red, which makes moving them around easier while keeping the same layout. Gosh, I hope that made sense! By flipping the photo, you can see where the blue "stars" blocks will go. 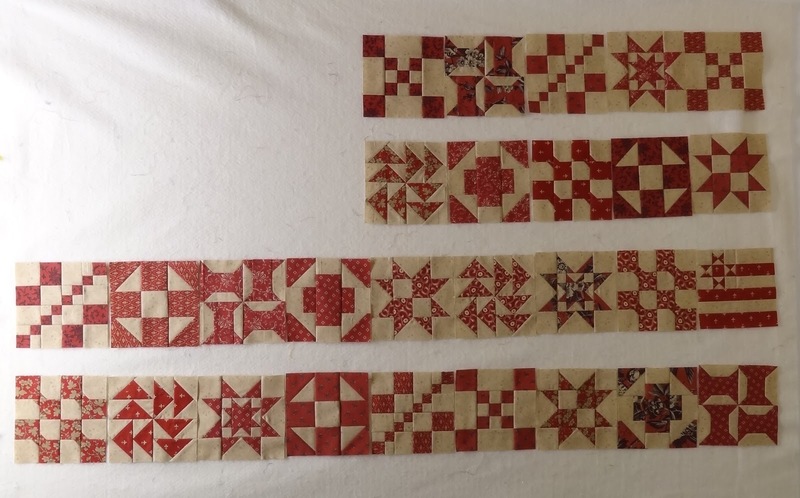 The "stripes" blocks will have sashing sewn between them, while the "stars" blocks will all be together with a separate border. I'll be back soon with the blue blocks. Thanks for stopping by! Your Old Glory quilt is gorgeous!!! Those blocks are a feast for the eyes Candace!!!! Oh is it ever going to be beautiful! How fabulous! They're wonderful. I did a close up of your Mini Flag block and I'm loving the background fabric. Lighting is so strange at times. I have a nice window in my sewing room yet some days the photos taken are dark. This is going to be a spectacular quilt. You're really in the zone. You've made fabulous progress Candace and the blocks are gorgeous. This quilt will be finished before you know it. It looks fabulous! Great job. Lovely progress. I know the feeling with light. I am having the same problems here getting my camera to capture exact colours. Funny, I was just thinking of you last night, and wondered what you were up to. Now I know why you've been so quiet - you have been busy! I just love this quilt. It looks awesome and I bet it's fun to make with the variety of blocks. Very cool! Looks like another stunning quilt. What a lovely quilt that's going to be!! WOW! You are making lightning fast progress on your flag & the blocks are are SO gorgeous ! Being retired military...this one is really, really special in my eyes! I do love a good flag quilt and this one is truly going to be a stunner. Love it! Great zone to be in! Love all your progress. Hope the dry weather eases up. You know I'm a red, white and blue freak and this is a MUST MAKE for me! I think I'm in L-O-V-E...with a quilt pattern, i.e. My heart is beating just a little bit faster after having seen your quilt. I want to join you in that zone, Candace! This is going to be amazing !! Your precision with these tiny blocks is just awesome! The flag block with perfect star is so cute! Can't wait to see what you plan for the setting. This is beautiful! Well, you know how I love red. Exquisite work, my friend!